Its Personal Information Manager this time. Yup…tried to install AM Notebook in my very new Windows 8 Operating system. Developers have finally started programming software that will work in Microsoft’s Windows 8 along with other Windows including XP, 7 and the like. And let me tell you…this software to manage personal information works really awesome in Windows 8. 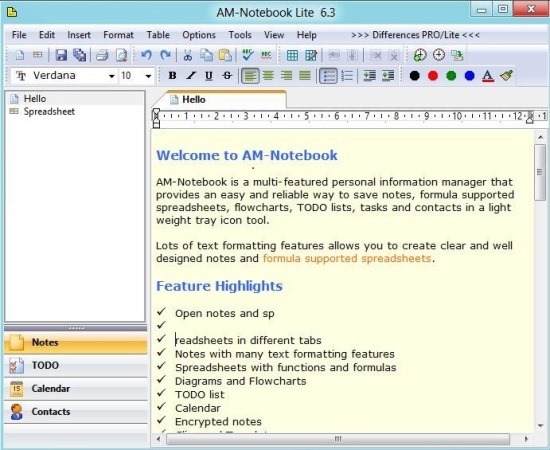 AM Notebook is a personal information manager supporting spreadsheets with formula, notepads, flowcharts, tasks manager, to do list creator and contacts in a tray icon. Over this software to manager personal info, you can use spreadsheet along with formulas for calculations such as average, multiplication, sum, and the like. In addition, you can take notes, save all important contacts and find them whenever required. Plus, this personal info manager allows you to check yearly, monthly, weekly, or everyday calendar, thereby tracking each moment of a day. Installing AM Notebook in Windows 8 is very much like how we install it in other OS such as Windows 7, Windows XP, and the like. But before I jump down directly to its installation procedure, let me quickly jot down the main features of this Software to manage personal info. Go onto the homepage of the website. AM Notebook will soon download as you proceed up with upcoming instructions. Also check out our post on Windows 8 Software To Convert Files. Yup…there you are. You have successfully downloaded the personal info manager. Go ahead and try out yourself now…!